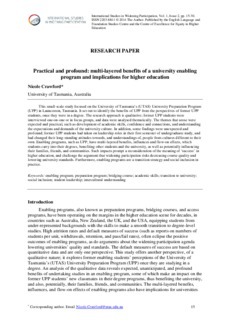 This small-scale study focused on the University of Tasmania’s (UTAS) University Preparation Program (UPP) in Launceston, Tasmania. It set out to identify the benefits of UPP from the perspectives of former UPP students, once they were in a degree. The research approach is qualitative; former UPP students were interviewed one-on-one or in focus groups, and data were analysed thematically. The themes that arose were expected and practical, such as development of academic skills, confidence and connections, and understanding the expectations and demands of the university culture. In addition, some findings were unexpected and profound; former UPP students had taken on leadership roles in their first semester of undergraduate study, and had changed their long-standing attitudes towards, and understandings of, people from cultures different to their own. Enabling programs, such as UPP, have multi-layered benefits, influences and flow-on effects, which students carry into their degrees, benefiting other students and the university, as well as potentially influencing their families, friends, and communities. Such impacts prompt a reconsideration of the meaning of ‘success’ in higher education, and challenge the argument that widening participation risks decreasing course quality and lowering university standards. Furthermore, enabling programs are a transition strategy and social inclusion in practice.